Every weekend I have the task to figure out how to make a nice lunch. When it’s just me alone during the week, I just toss a few things together and wouldn’t go to much more effort than that. However, on the weekend, we try to have a nice lunch as well as dinner, double the work! So this is a very simple and nicely filling meal that is easy to make. La Salade Nicoise. There are so many variations on it, however, I used the easy way out with canned tuna vs a nice fresh grilled tuna. I had some colorful purple potatoes, which added nicely to the presentation. I also cooked some eggs, I usually calculate 2 per person. The best way to make a hard-boiled egg is to place the eggs in a pot, covered with cold water. Once the eggs boil, take them off the stove and cover for 20 minutes, that’s all it takes and you will have perfect hard-boiled eggs, as opposed to exploding eggs or whatever I used to get in the past. I also steamed a bunch of green beans. It is important not to over cook the green beans. 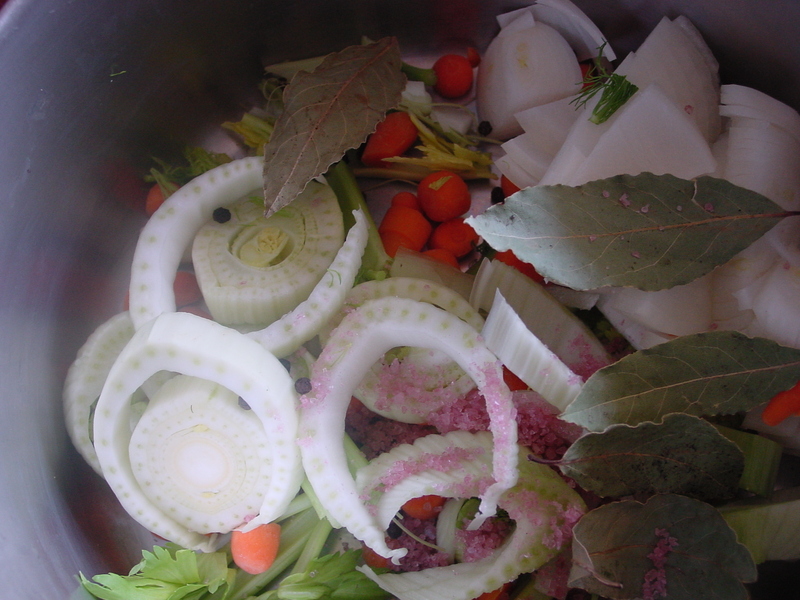 Once they are cooked, plunge them into cold water to stop cooking and preserve the green color. For the lettuce, I used an organic baby green mix as well as some romaine lettuce to give it a nice balance of crunch and texture. I’m not sure if I added any cucumbers or tomatoes, it doesn’t look like it from the photo, but they would go nicely had I had some. Hardboiled eggs-2 per person, Canned or fresh tuna, a bunch of steamed, cold green beans, boiled potatoes, about one or two per person. Once all the cooked ingredients were ready and cool. I started to compile my salad. I tossed the greens with the dressing ahead of time. 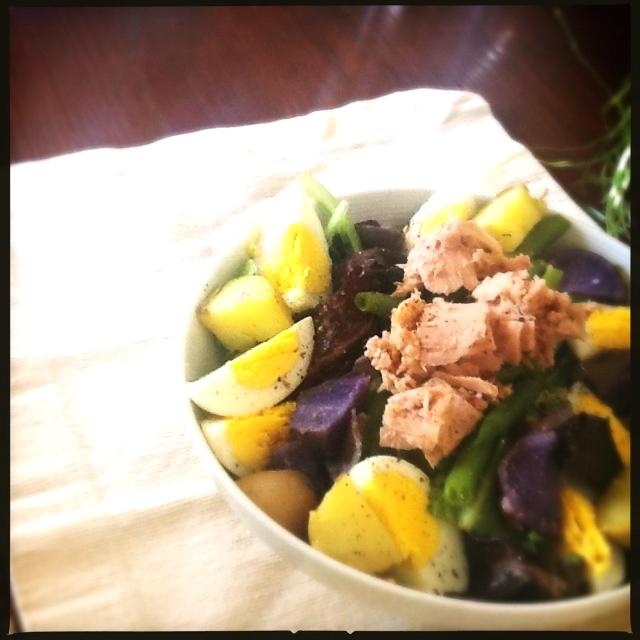 Placed it in nice bowls, added pieces of potato, egg slivers, black olives, green beans and then the tuna on top of it all. 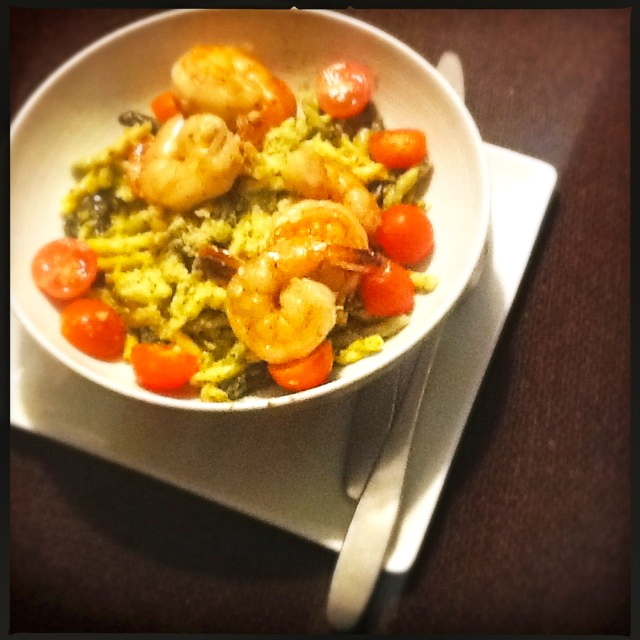 Try to make it as pretty as possible, symmetry is key in this dish for me. But you can get creative and design it as you like. If you don’t care, you can just toss everything together and voila, it’s done! I like to add fresh pepper and a few grains of Sel de Cali. How delicious. I finally used my fish stock that I made and froze a few weeks back. 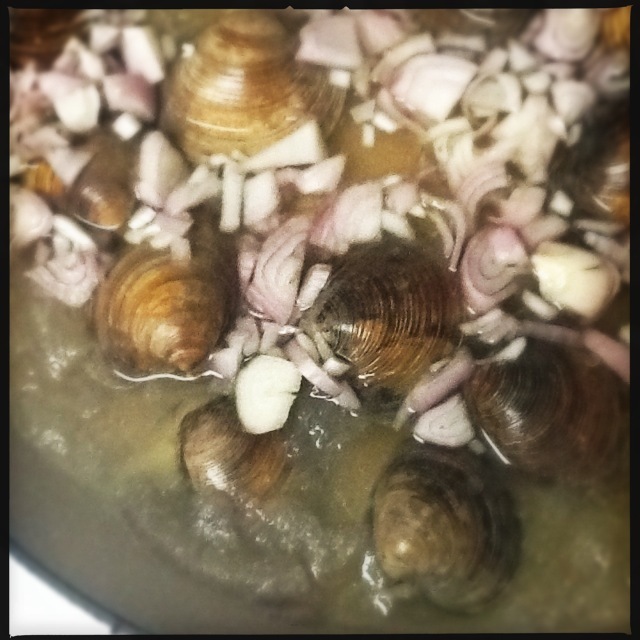 I steamed my clams in the fish stock with a bunch of chopped shallots that Paul had accidentally chopped when making Boeuf Bourgignon, when the recipe he was using asked for whole shallots, so I had pre-chopped shallots. Yay. I have to say that you should soak your clams in fresh water, a bit of salt and a spoon of polenta or some type of grainy flour, if you have. Soak for at least one hour to make sure the clams purge all the sand out. There is nothing worse than chewing on sand. 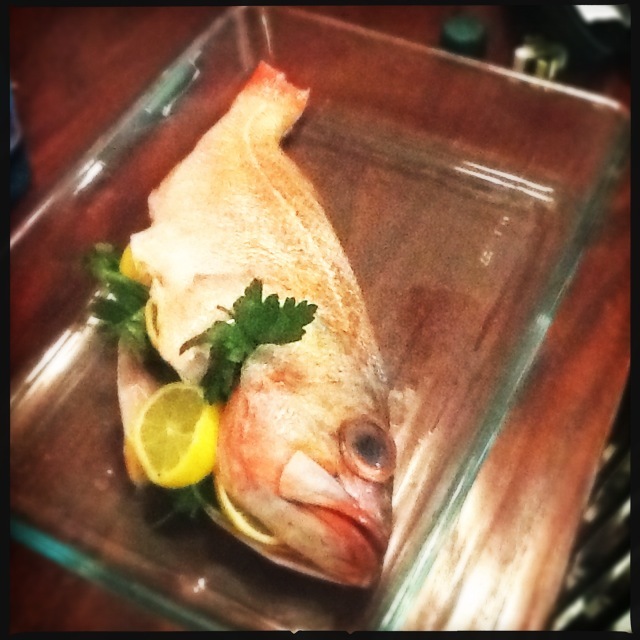 Once I got my clams situated, I stuffed a gorgeous red snapper with a big bunch of parsley and sliced lemons. I dusted the fish with lovely Sel de Cali and then popped it in the oven for about 20 mins at 350 degrees. Since the fish was large, I fileted it once cooked. I didn’t do the best job presenting my meal. I think it lacks color for sure, but I was hungry. Had it been for guests I would have added a small bed of parsley with lemon slices and something red, like a little cut out red pepper flower or something to accent my Sel de Cali. I bought a great red snapper at the Seafood warehouse in San Pedro and my friend bought a huge fish, I can’t remember the type, but she had the man filet it. He asked if we wanted the discarded parts, I decided to take them home and make a fish stock. I added just about everything appropriate I had in my fridge. I filled a large pot of water, added some chopped up fennel, coarsely chopped onions, chopped baby carrots, normal carrots are fine, I just didn’t have any. I also added a few celery stocks with their leaves, a few, about 4-5 bay leaves, about 1 tablespoon pepper corns and a large scoop of salt. I added my Sel de Cali, giving it a bit wine infused sea salt flavor. I let the stock simmer for about 1.5 hours. I strained and transfered the stock to Tupperware and once cooled, I put them in the freezer for future use. I have to say, this stock was the easiest and tastiest stock I’ve had. It really makes a huge difference making it yourself, however, man did it smell fishy. The apartment smelled fishy and my hands were fishy, but nothing like a few candles and some lemon juice for my hands, the smell was gone. 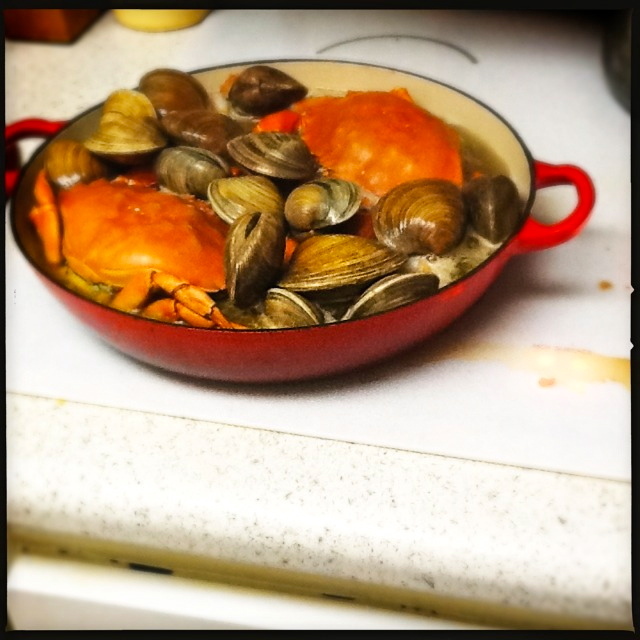 I later used these stocks for a simple steamed clam recipe, so simple, just put the stock and steam the clams! I also used it for my seafood stew. I hope you enjoy. My fish stock that I previously made was fully thawed. Chop the shallots and celery and saute for about 5 minutes in a pan with a few tablespoons of olive oil. Add the scallops and sear about 2 mins per side. Remove scallops and put them aside for later. Add the white wine to the celery shallot mixture, about a big glass. Let some of the wine evaporate a bit and then add the fish stock. Start a big pot of boiling water to cook the crabs. Once the water is boiling add salt, pepper corns and red pepper flakes to give a bit of flavor to the crabs. Carefully place the live crab into the boiling water and let cook for about 10 mins. once cooked add them to the fish stock mixture. Peel and chop a tomato and add to the pot. Add the shrimp and cook for about 5 mins. Lastly add the clams and previously cooked scallops. You will be ready to eat in about 4 minutes. 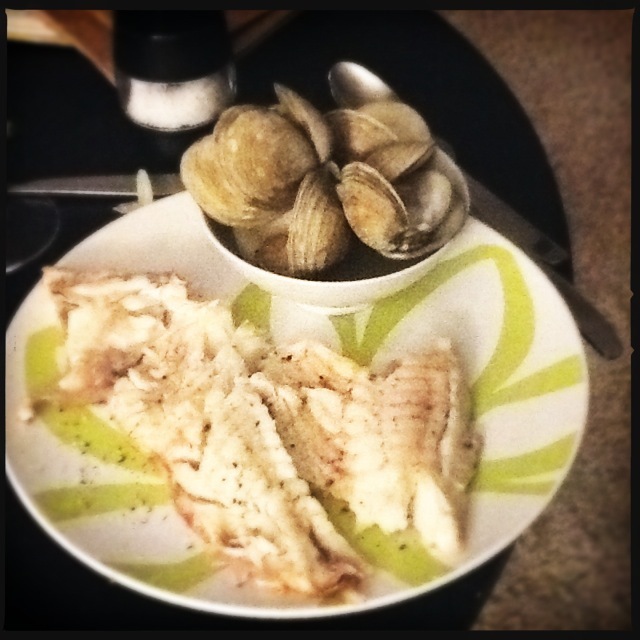 Just make sure all clam shells are open which is a good indication that your meal is ready to eat. A big YUM! It was truly delicious. I do wish I had fennel though, next time. I went to my fabulous Fish stop to stock up on yummy seafood. I love going to this warehouse. I feel like I’m on a hunt. I never really know what the fisherman will have, yet whatever it is, it’s always fresh and delicious. Today I decided I would use up my fish stock to make a seafood stew. I got 2 huge crabs and 2 lbs of clams for nothing. My friend got a gorgeous Mahi Mahi, the lady at the shop told my friend’s 4-year old, “Mahi Mahi is so great they had to name it twice.” I just love it on the docks of San Pedro. The nice, friendly Mexican guy working on cleaning the fish gave the little girl the fish spine to give to the seals off the dock. 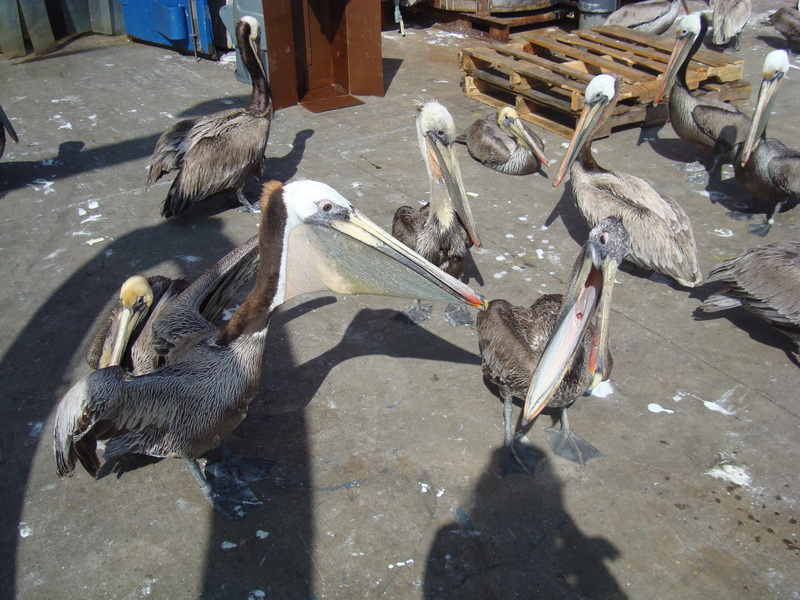 We went out with our fish guts and got swarmed by over 30 hungry Pelicans. 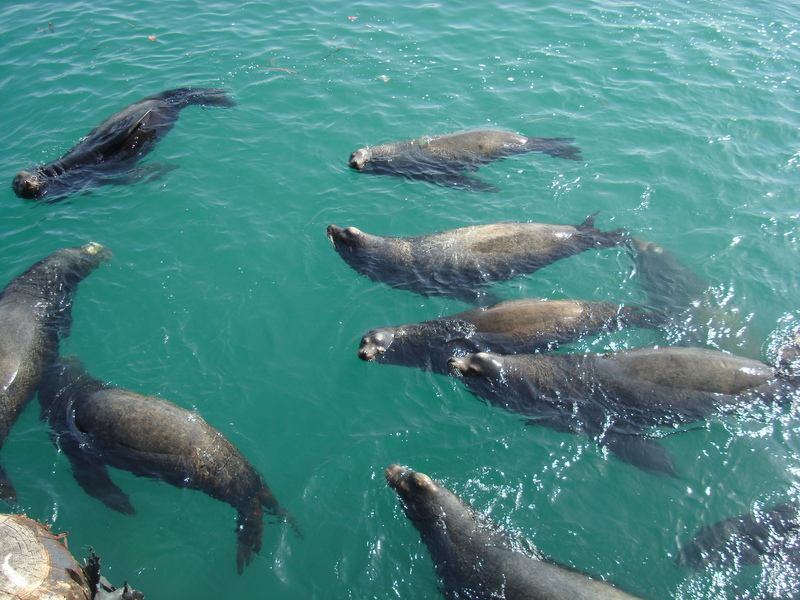 She tossed the fish remains in the water and sure enough, over 15 Lion Seals came swimming. It was the coolest thing, so pure. So pure that I was scared of all these animals rushing towards us. We weren’t in a safe-aquarium environment, we were in the wild, in a way. The pelicans were at my feet. I got over the fright then grabbed my two angry crabs and fresh clams. I got home and put them right away in the fridge. I placed the clams in a bowl of salt water with about a tablespoon of polenta, apparently it helps purge the clams of any sand. I perused different recipes for seafood stew and other types. Most all required fennel. I didn’t have any. I used a bit of celery instead.